This collaboration will focus on the many issues—personal, professional, business, regulatory—that affect the practice environment and well-being of family physicians. Together we will bring information and resources to assist today's family physician in meeting the quadruple aim: improving population health, increasing patient satisfaction, reducing costs, and improving physician satisfaction. From news to expert commentaries to journal articles and beyond, we are working together to bring family medicine physicians the most timely, authoritative, and useful information that supports well-being, professional satisfaction, and a healthy work–life balance. Addressing SDoH: Finally, Tools for PCPs AAFP has created a wealth of resources to allow primary care practices to identify and address social determinants of health. Practical Resources From AAFP for Addressing SDoH Physicians know that social determinants of health are important. AAFP now provides the tools to be able to address them in a meaningful way. High-Tech and High-Touch: Consider a Career in Family Medicine Why should students consider family medicine? Maureen Murphy, MD, explains how those with wide-ranging interests may particularly enjoy the never-ending diversity of this specialty. Ready to Start Your Own Practice? Needing a practice change but don't know where to start? Dr Julie Gunther has been there and offers her advice. 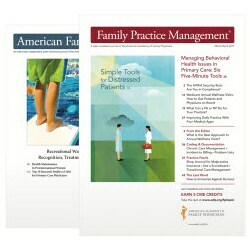 Telemedicine for Family Medicine Practice Let AAFP help you make the leap to telemedicine. Reduce Stress by Reframing Dr Jay Winner describes 'reframing,' a technique in which thinking about a stressful situation a little differently can reduce stress. Upcoming MACRA Requirements for Patient Engagement Dr Steve Waldren, AAFP informaticist, discusses technology requirements that will help improve patient engagement and your professional practice as well. Leadership Skills for the Non-Leader All doctors have leadership skills, whether they realize it or not. Dr Clif Knight discusses with Drs Melissa Hemphill and Vu Kiet Tran how family physicians can develop these skills and reduce burnout. Contract Negotiation: Tips for the New Physician In this short video, Dr Lee Mills gives practical information on contract negotiation. Rx for Stress: Mindfulness Reduce your daily stress and improve job satisfaction with mindfulness. Dr Jay Winner offers a quick and easy tutorial. Direct Primary Care Lets Me 'Be the Doctor I Wanted to Be' Giving up a systems job for direct primary care helped Dr Julie Gunther revive her spirit for family practice. Transforming Practice to Improve Professional Satisfaction Do you look forward to Mondays or Fridays? This discussion with practicing family physicians will help you reinvent your practice so that you will look forward to Mondays. The ABCs of Telemedicine What are the key steps to take in order to successfully--and profitably--implement telemedicine services? Why Family Medicine Burnout Is Different (and How Docs Fight Back) What are the aspects of family medicine that make these physicians uniquely vulnerable to burnout--and the strategies that can mitigate it? Fighting the Need to Control Everything Letting others take care of issues not pertaining to patient care helps prevent burnout, says Dr Breish. Facing Burnout the First Year of Residency Resident Kristina Dakis describes her early brush with burnout from family medicine. Determine Your Personal and Professional Priorities Family practice resident Dr Lauren Williams explains how setting priorities and saying no helps her manage her busy personal and professional life. 'Personal Resilience' Can Help You Thrive With opportunity, innovation, and passion, resilience 'flows along,' says family practitioner Dr Munzing. 3 Steps to Minimize Burnout Dr Melton describes three ways to avoid burnout that he learned during his lengthy family practice career in rural Virginia. A 'Passion' for Family Medicine Solo practitioner Dr Karen Smith reveals that passion for family medicine fuels her practice in a rural community and fuels her voice in Washington, DC. Don't Be Afraid to Grab the Reins In this perspective, Dr Ryan Neuhofel describes why he chose a direct primary care model as his path for professional autonomy. Resilience and Burnout in Family Medicine Drs Yu and Colón-Gonzalez discuss qualities of resilience and offer their tips to help other family medicine physicians minimize burnout. AAFP President: Time for our US Leaders to Listen to Us The AAFP president discusses the proposal for changes to current healthcare law that the organization has sent to Congress. ACC/AHA Hypertension Guideline: What Is New? What Do We Do? Physician Employment Contracts: Do Your Benefits Measure Up? Which Quality Measures Should You Report? The mission of the AAFP is to improve the health of patients, families, and communities by serving the needs of members with professionalism and creativity.